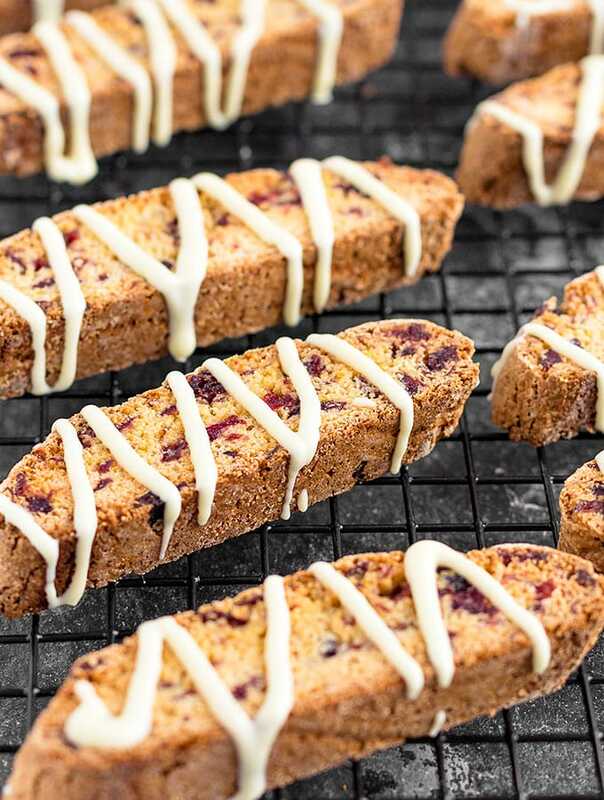 Cranberry Orange Biscotti with White Chocolate – biscotti studded with flecks of dried cranberries and orange zest, and finished with a drizzle of white chocolate! Biscotti is an Italian word meaning “twice baked” and it’s also the general word for cookies. 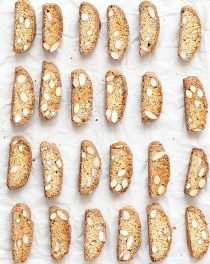 While Americans call these cookies “biscotti”, in Italy they are commonly referred to as “cantucci”. The original recipe calls for almonds, and today I am sharing with you a seasonal version: cranberry orange biscotti with white chocolate. 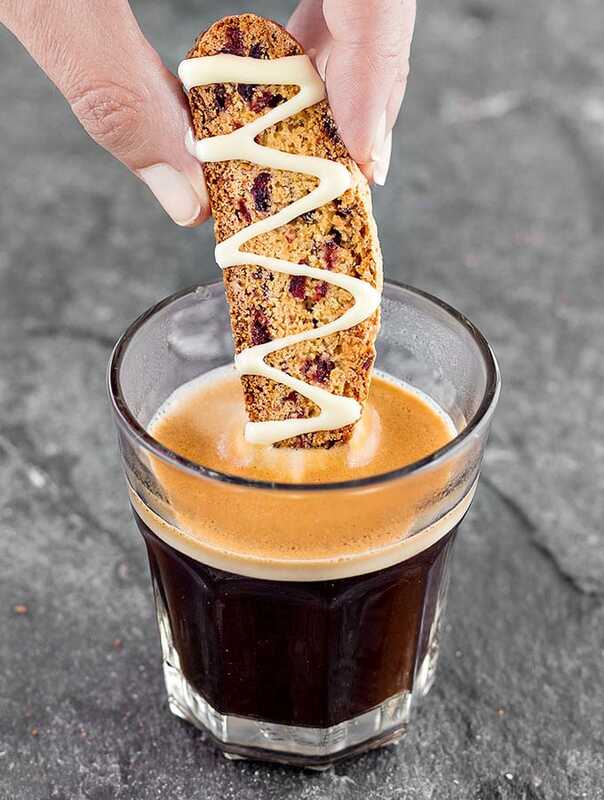 Biscotti are sweet, crunchy, and perfect for dipping in your morning or afternoon coffee. They are incredibly easy to make: no stand mixer is required, just one bowl. You simply mix all the ingredients together, form a dough, shape it into a log, and bake. Then slice the log with a sharp serrated knife, and bake the cookies again until they’re dry and crispy. The dough is rather crumbly, but don’t be alarmed. Keep kneading and I promise it will become softer and stickier. The white chocolate drizzle makes them a bit more special but it’s completely optional. If you’re not a fan of white chocolate, use dark or semi-sweet. Just make sure that you use a good quality chocolate bar, not chocolate chips, as chips don’t melt as smoothly. 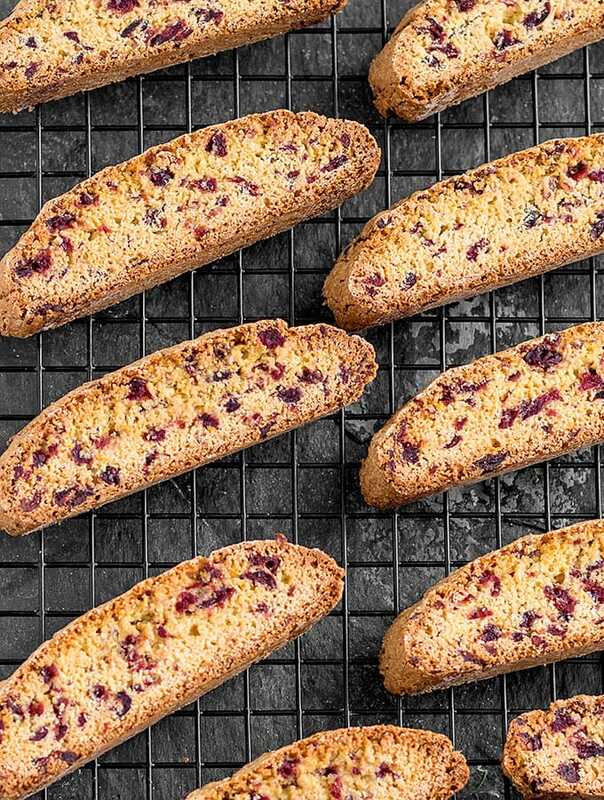 These cranberry orange biscotti will keep fresh for up to 2 weeks when stored in an airtight container, which makes them great for holiday baking! 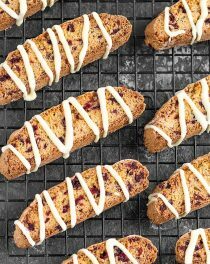 Bake a batch of these cranberry orange biscotti for your holiday cookie platter and let me know what you think. Leave a comment, rate it, and don’t forget to take a picture and share it on my Facebook page or tag it #aseasyasapplepie on Instagram! 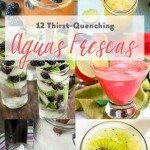 I love seeing what you come up with! Cranberry Orange Biscotti with White Chocolate - biscotti studded with flecks of dried cranberries and orange zest, and finished with a drizzle of white chocolate! 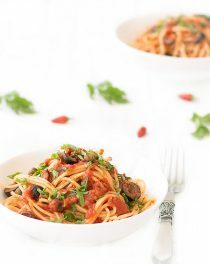 In a large bowl, combine the flour, baking powder, and sugar. Add the eggs, honey, orange zest, and mix all the ingredients. Once you have a crumbly mixture, add the cranberries. Transfer the dough onto a lightly-floured surface, and knead until it's soft and slightly sticky. Roll it into a log that is approximately 30 cm (12 inch) long, and 5 cm (2 inch) wide. Place the log on a baking sheet lined with parchment paper or with a silicone mat. Remove the log from the oven and let it cool for about 10 minutes. Place the log on a cutting board and, using a sharp, serrated knife, cut it diagonally into 1.5 cm (½ inch) slices. Place the white chocolate in a microwave-safe bowl. Melt in 15 second increments, stirring after each increment, until completely melted and smooth. Add the melted chocolate to a small bag, snip off a small corner, and drizzle over the biscotti. Allow the chocolate to set in the refrigerator for about 30 minutes. 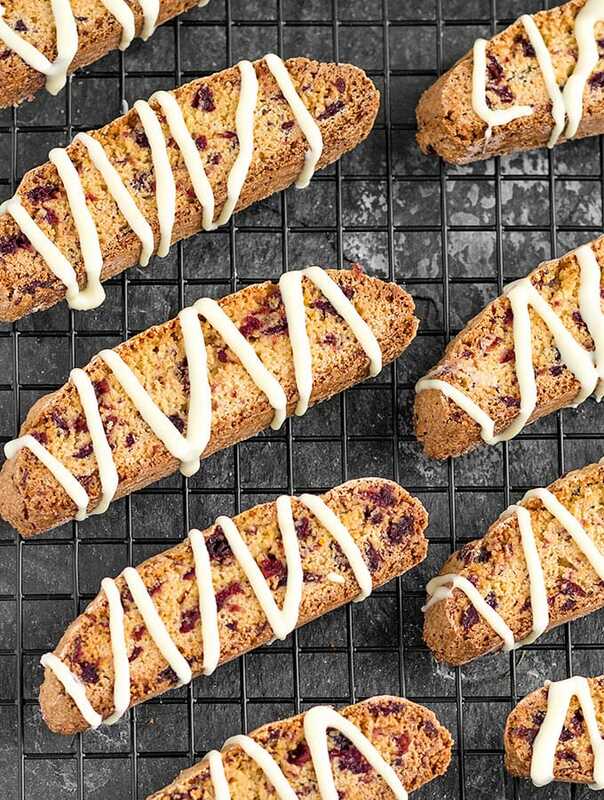 Store the cranberry orange biscotti in a sealed container for 2 weeks or freeze for up to 3 months (without the white chocolate). I am glad you liked them, Sarah. I love these biscotti, even more than cantucci. I couldn’t find my usual recipe for orange biscotti, so I decided to give this one a go. I couldn’t help squeezing the juice from half my orange after zesting it, so the dough was naturally a tad sticky, but that’s to be expected. I like the way the log formed in the oven, it spread before it rose, giving it that traditional biscotti shape once cut! My other biscotti logs tended to be a bit more dense and didn’t spread much. I’ll definitely try them again!